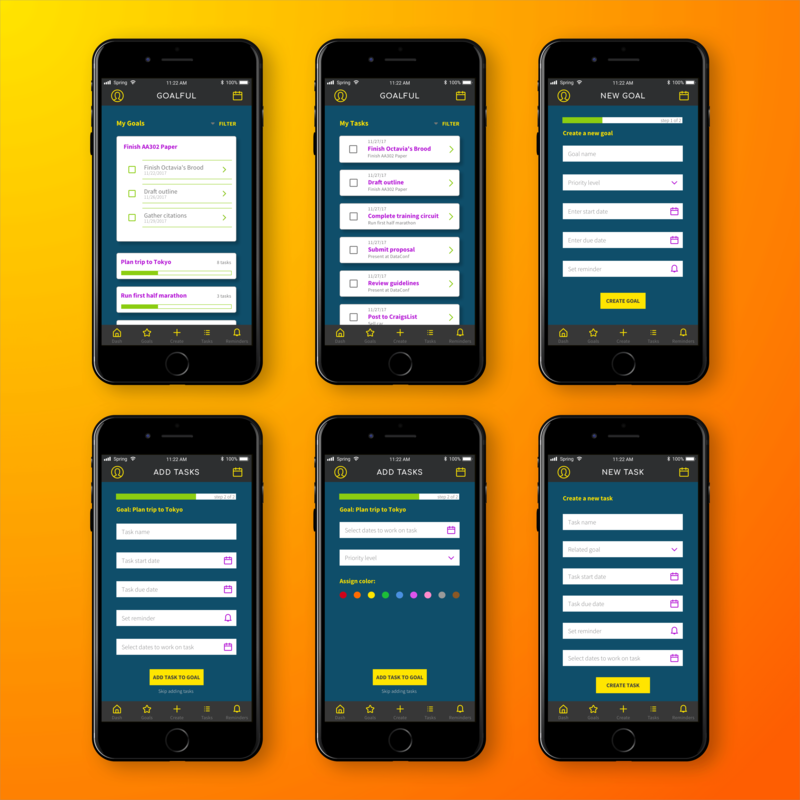 Goalful is a mobile productivity app that aims to help people set goals with clear tasks, schedule tasks, and track progress. People need a streamlined, easy-to-use method of creating and managing big-picture goals and the tasks to get them there. A mobile app that helps people set and track tasks and goals, all in one place. Develop a research-informed understanding of when, how, and why people set goals and manage tasks. Understand the current challenges people face with setting goals and managing tasks. Design a product that improves the user experience of clearly defining, prioritizing, and working to accomplish goals. There are plenty of goal-setting and task management approaches and methods, from bullet journaling on paper to sophisticated software, and many tools in between. Yet, people tend to devise makeshift systems of task management tools to “make it work” for them. This results in inefficient use of time and loss of information across tools, which ultimately defeats the purpose of the tools to begin with. There are a number of popular, well-designed products that offer unique approaches to managing goals and tasks, but there doesn’t seem to be a single tool that helps people to manage goals and tasks. 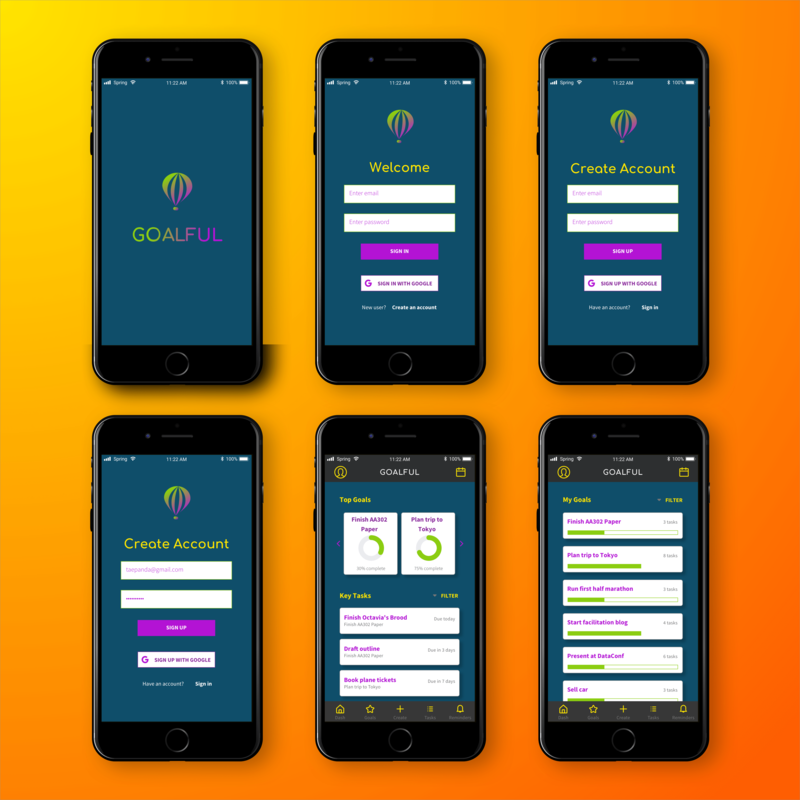 Goalful seeks to solve this problem by providing people with a set goals with clear tasks, schedule tasks, and track their progress, so that ultimately, people can be more productive as they work towards accomplishing their dreams. I conducted a heavy discovery phase focusing on user research to identify people’ goals, priorities, needs, frustrations, and behaviors related to setting goals and managing tasks. I analyzed the existing market of digital task management products and noted possible areas of opportunity to better meet user needs, as informed by primary and secondary research. I delivered a concise UX strategy articulating user beliefs, attitudes, needs, and beliefs for goal setting and task management. I identified core pain points people currently experience that a new product could address and improve. I articulated a vision for how the new product would improve how and why people set goals and manage tasks. 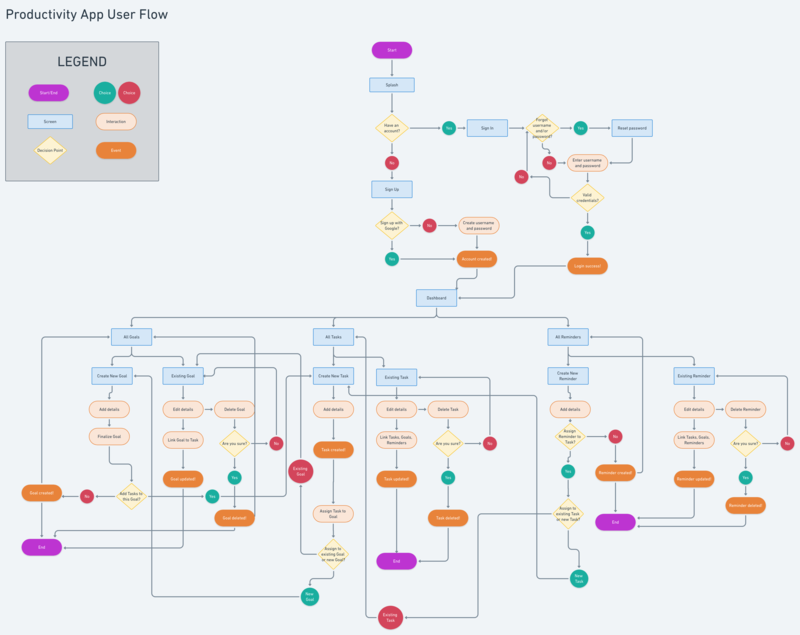 I developed a clear application map and user flows to facilitate multiple user journeys, focusing on the creation of new goals, creation of new tasks, and calendar management. I designed a research-informed product prototype with key screens for common user interactions. I conducted multiple rounds of usability testing to gather user feedback on the proposed prototype. I identified and implemented modifications to the prototype to improve the interaction design of the product. I implemented research-informed changes into the prototype. I developed a coherent branding strategy, including logo design. I delivered high-fidelity design composites of key screens and a UI kit. In order to better understand user needs and behaviors for goal setting and task management, I designed and conducted surveys and interviews, and recruited people who had experience setting goals to participate. The surveys and interviews revealed a few core user needs in goal setting and task management. Overall, people reported the desire for a product that would not only help them stay organized and keep track of goals and tasks, but to be able to clearly see how tasks are related to goals, the progress they are making towards accomplishing the goals as well. Quotes from research participants about features of ideal task management tools. Text version of quotes is available here. In addition to primary research, I conducted a competitive analysis of popular apps and tools for task management. Through competitive analysis, I was able to identify the core features of popular task management apps, such as the ability to move items across goals, to collaborate with other users, and to assign due dates. I also identified features that current products were missing, such as targeted coaching on goal-setting, task prioritization, and an activity log. The products I compared in the competitive analysis were informed by primary research, in that I included products that participants reported using for task management. 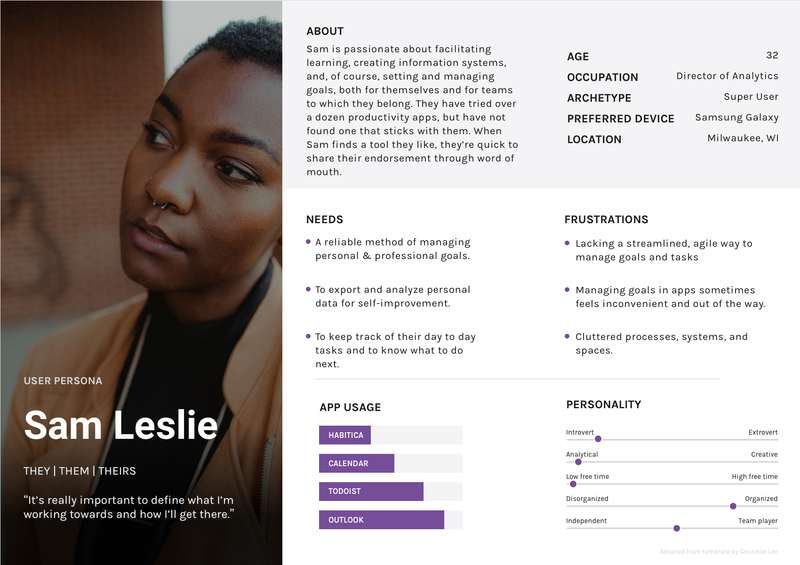 Through the surveys and interviews, two key user personas emerged — (1) the spontaneous, entrepreneurial Millennial who sets goals and tasks as needed, and (2) the project manager who has tried dozens of productivity apps and is still in search of the ideal task management tool. 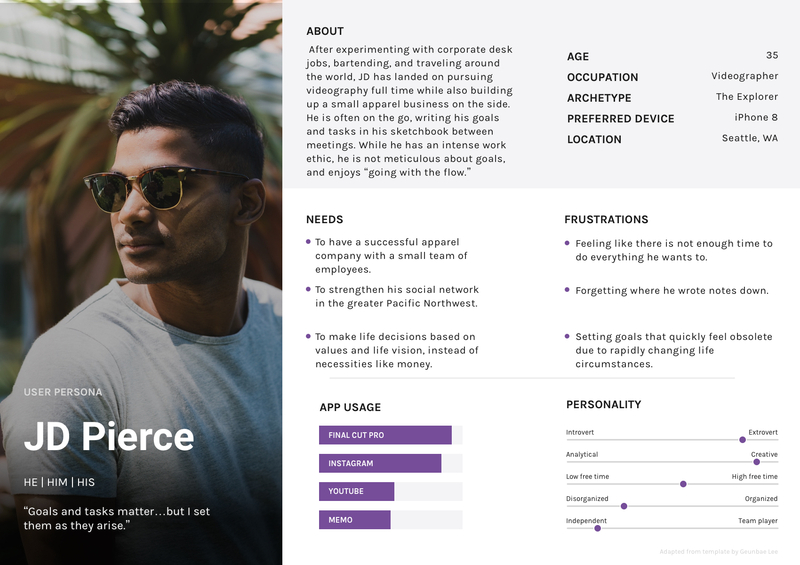 The personas helped to highlight some core user priorities: people want a tool that helps them save time, that syncs across devices, that connects tasks to bigger-picture goals, and that helps them stay organized and feel in control of what they need to accomplish. Sam is a persona who represents people who frequently try products and services to support their productivity. JD is a persona who represents people who keep track of goals and tasks through multiple means, including paper notes and memos in devices. 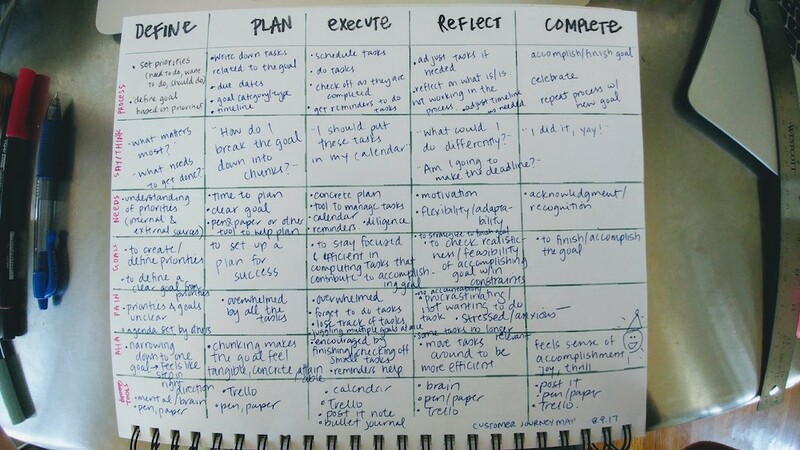 In order to further hone in on the experience of working towards accomplishing a goal, I developed a journey map. The journey map provided a visual representation of the emotions that a person might feel while setting out to accomplish a goal. First version of a journey map, representing a user’s goals, pain points, thoughts, and behaviors. Through the process of designing a journey map, I distinguished five overarching phases of a person’s journey towards accomplishing a goal: defining it, planning it, executing the plan, reflecting on the execution, and completing the plan. Developing a journey map was particularly crucial for identifying the pain points someone might feel — and the emotional “roadblocks” or “barriers” that one might face — in the process of accomplishing a goal. 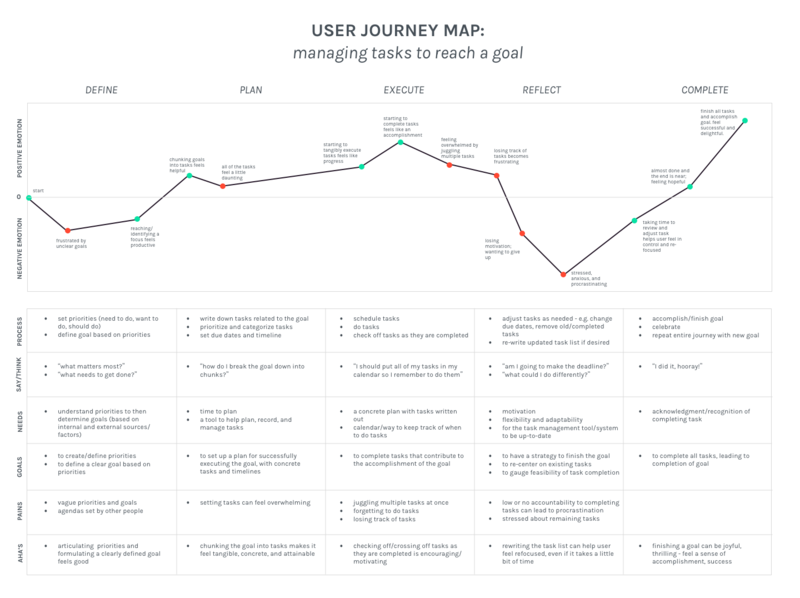 Iterated journey map representing a sample user’s experiences with managing tasks to reach a goal. Task management needs to be clear, organized, and easy for people to adopt. There is no single tool that supports user task management right now. Focus specifically on user experiences with setting life-cycle goals (with clear end dates) and managing tasks related to those goals. Informed by both the primary and secondary research findings, I drafted an application map to organize content and features. I considered the priorities that research participants indicated as important — such as creating goals and tasks, having a calendar, and having reminders — and mapped how they might relate to one another within the information architecture of the product. I also designed a user flow to represent some common paths that a user might take in interacting with the product, and to think through the possible outcomes of a given flow, based on decisions that people might make within a task. Based on common flow patterns identified in the competitive analysis, I outlined flows for creating and logging into an account, creating a new goal, creating a task within a goal, and viewing and scheduling tasks through a calendar. User flow showing multiple pathways a person could take to create and organize Goals, Tasks, and Reminders. Flow is also available for view here. The application map and user flow informed the key screens that I developed in the first set of low-fidelity wireframes. I sketched screens based on the content of the application flow, and I used the user flow to keep track of the interactions that I needed to include in each screen. 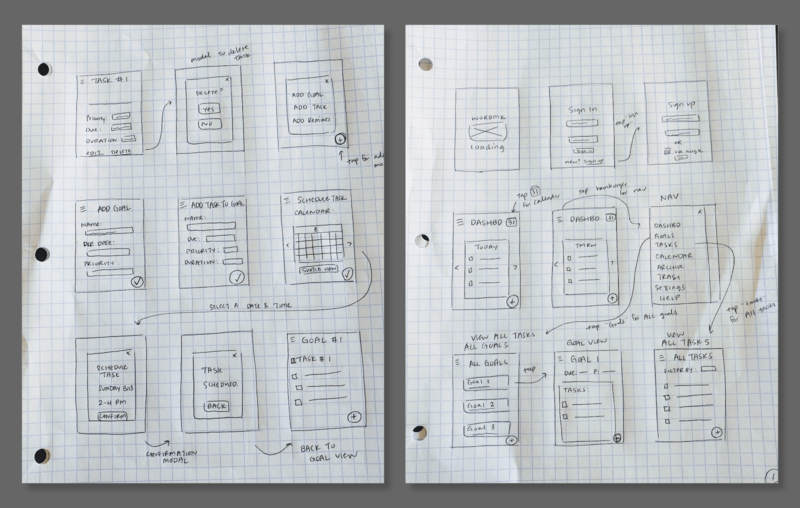 I focused on the core user needs that research participants had emphasized—the desire for a simple, clean, and clear product navigation and an explicit connection between tasks and a calendar — as I sketched the wireframes. Low-fidelity sketches of some key screens. Based on the user flows I had designed earlier, I designed mid-fidelity wireframes of screens for users to sign up, create a goal, and create a task associated with the goal. I used InVision to make the wireframes dynamic, so that I’d be able to evaluate how people engage with the proposed screens and identify sources of user error and frustration early in the design process. 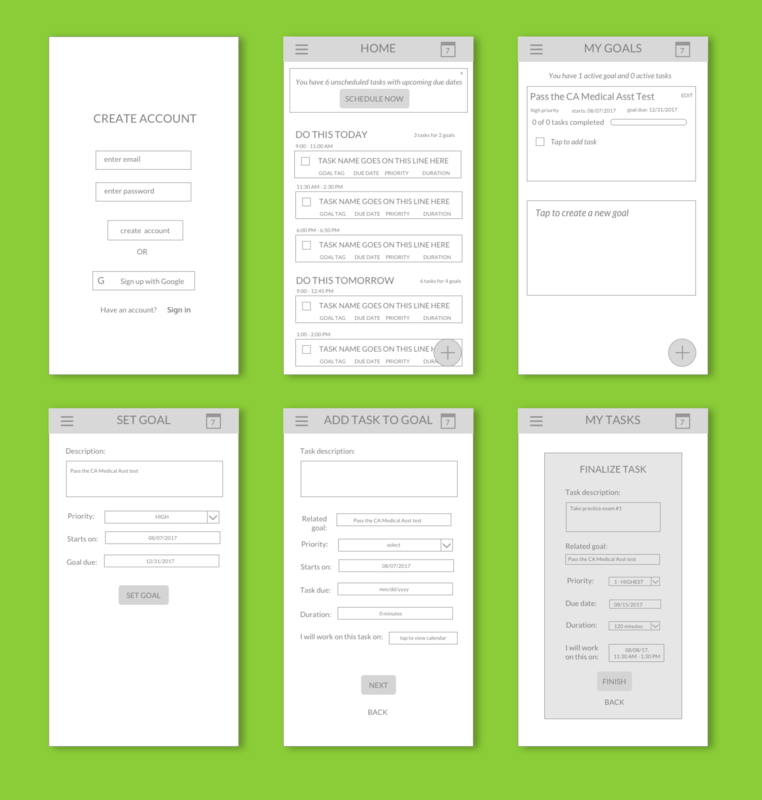 First set of mid-fidelity wireframes. Would people be able to create an account, create a goal, and create a task? Where might people struggle with completing these core tasks? What suggestions might people have for improving the interaction design of the prototype in order to make it easier to navigate and understand, and to make the experience of setting goals and managing tasks more enjoyable? People wanted a way to clearly see progress on goals. People were confused by the term “Dashboard” to represent the Home screen, and wanted the Home screen to provide some contextual information about their overall progress on goals and tasks. People wanted to be able to add reminders to a task when creating it, not as a separate activity afterwards. Quotes from participants of usability tests. Quotes can be viewed as a text document here. After identifying the core themes that had emerged from the first round of usability tests, I was able to make informed iterations to the prototypes, design additional screens as needed, and proceed with a second round of testing. I iterated on the mid-fidelity wireframes based on suggestions that had emerged from the first round of usability testing. I updated form fields within the screens for adding goals and tasks, and added contextual information about progress towards goals to the home screen. With a round of iterations in place, I set out to conduct a second round of usability tests. 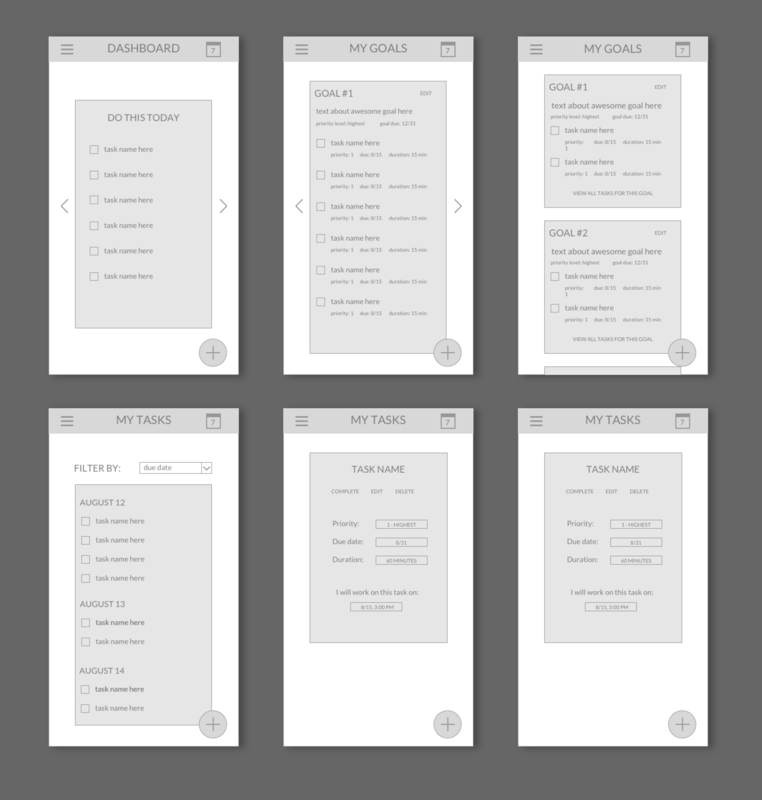 Second set of mid-fidelity wireframes, with iterations based on first round of usability testing. In the second round of usability testing, participants shared positive feedback about the additional contextual information provided in key screens, and successfully navigated through the core tasks. At the same time, the tests revealed a few additional key areas of improvement for the prototype that had not emerged in the first round of testing. One area of improvement was to replace some text with icons; people reported that doing so could ease their navigation through screens and improve their navigation speed. 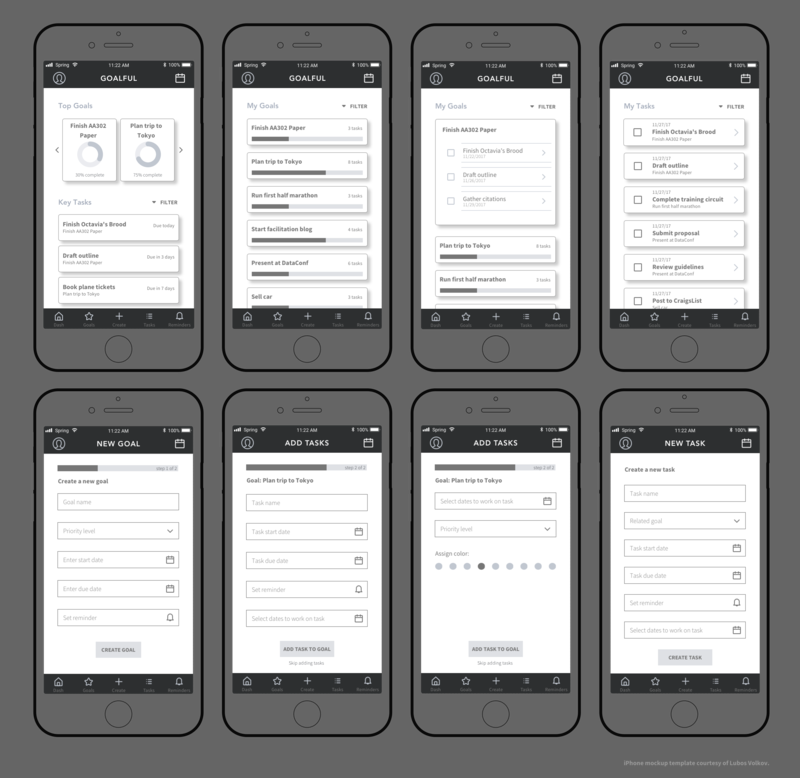 Third set of mid-fidelity wireframes, based on feedback from two rounds of usability testing. In the next round of iteration, I incorporated icons into the form fields and eliminated instructional language in the “My Goals” screen that said “tap to add a new goal.” I simplified the screens and reduced the amount of reading required. Another major change was the incorporation of a bottom navigation menu instead of a hamburger menu. Through this change, I aimed to make it easier for users to access goals, tasks, and reminders, and to create new items. Until this point, the product had been nameless, so I experimented with variations on the terms “goal” and “task,” and the name Goalful emerged. Goalful plays on the saying that “a goal without a plan is just wishful thinking.” The idea is that “goalful” thinking and behavior — one that centers on creating goals with concrete tasks — helps people be more productive and successfully achieve their goals. In order to design a logo, I solicited user feedback on images they associated with the terms “goal” and “task.” People shared images such as soccer nets, victory “V” signs, marathon finish lines, clipboards, a mountain summit, and a hot air balloon, which ultimately became the basis of the final logo design. Sample logo designs from brainstorming. After reviewing my findings from the initial research phase, I observed that many of the competitor products have predominantly blue color palettes and evoked a sense of simplicity, informality, and friendliness. I experimented with color palettes and typography that would convey some of the same values and characteristics as competitor products, but would also convey reliability, productivity, efficiency, and organization — all of which, according to initial user survey participants, are key for tools that support task management. In order to narrow down the choices of possible color palettes, I went back to people to gather their input and found that people had the strongest preference for the palette that incorporates green, yellow, and purple. From there, I further refined the specific hues of the chosen palette in order to better reflect a sense of vibrancy and affirmative energy. After several rounds of usability testing and iteration, I incorporated the branding and visual design to produce high-fidelity composites. High-fidelity mockups of onboarding and dashboard screens. Throughout the visual design process, I checked color contrast of elements to ensure visibility. While color choices support the overall tone of the app, Goalful strives to be accessible for users who are low-vision and/or colorblind. High-fidelity mockups of dashboard, adding new goals, and adding new tasks. This project is only the beginning of a larger, longer design process, and there is plenty of further research, iteration, and design to improve the usability and viability of Goalful. While this initial design process focused specifically on the flow of a new user who was creating a goal and task for the first time, it would be critical to design screens that show multiple combinations of goals and tasks. It would also be critical to design onboarding screens to represent the ways that the product helps people learn its features and functions. Future iterations of Goalful also need to include the additional features proposed in the initial application map, including the standalone Calendar feature, the My Tasks screens, the Trash and Archives, and the Settings. 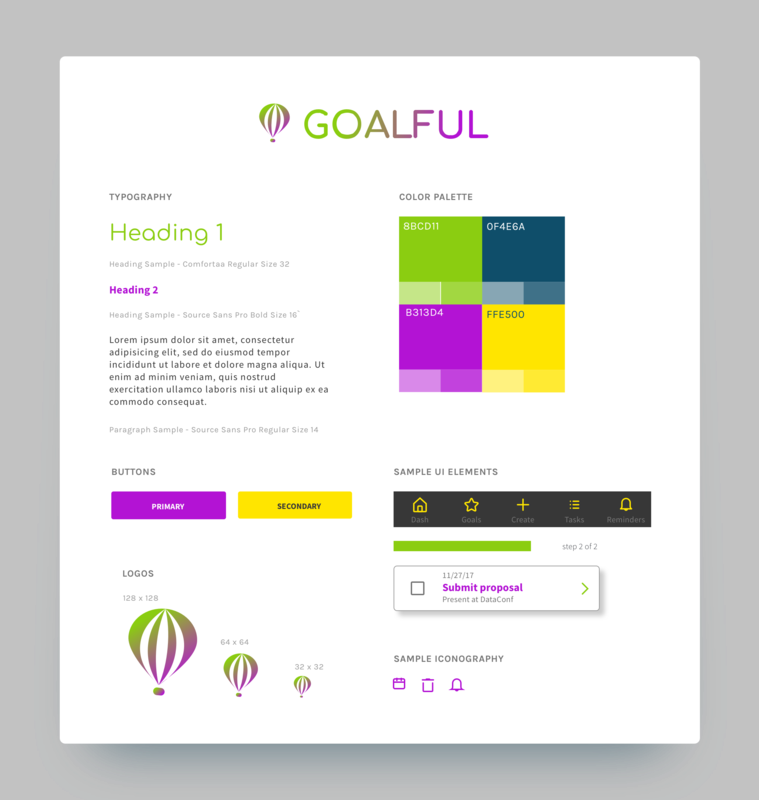 Furthermore, it would be important to consider the design of Goalful’s desktop-based app. Although this project was scoped to mobile app design, the majority of user research participants sought products that can be synced across devices and work fluidly on both desktop and mobile devices. In order for Goalful to meet a core user priority, it would be necessary to design a desktop version in the future as well. One lingering question for future exploration is the following question: Can a digital task management product replace, or otherwise emulate, the satisfaction that people report experiencing when physically crossing off items on a paper to-do list? While many people in the research phase had reported using apps and other digital tools to keep track of goals and tasks, others reported that their preferred modes were analog, including sticky notes and bulleted lists. As Goalful evolves, it seems critical to further explore the reasons people continue to prefer analog task management methods, and to develop a clearer understanding of how a product like Goalful can complement or replace analog goal setting and task management.. Finally, it is critical to solidify the language used to market Goalful. As defined in the initial problem statement, Goalful essentially seeks to provide people with a new way to approach task management. It seeks to explicitly connecting tasks to bigger-picture goals and encourages people to schedule time for completing tasks, rather than just offering people a space to create lists of tasks. By encouraging people to think about and set goals first, and by only allowing people to create tasks that are related to goals, Goalful challenges one conventional definition of productivity — one that says productivity is the completion of to do lists — and encourages people to prioritize tasks based on the goals they truly want and need to accomplish. At the same time, this begs the questions: Is Goalful a goal-setting app? Is it a task management app? Is it both? Is it neither? It seems that the marketing language that is used to communicate the value proposition of the product is just as crucial to the potential success of the product as its design. Thus, further clarification of how we talk about Goalful — what it is, how it uniquely, positively benefits people, and why it does what other existing products can’t — is a core priority of future iteration. © 2019. Designed + Built by ERIKA HARANO.